About Me - Harry Schmeider "The Ambassador for the Bluebirds"
I was born and raised in Butler, Pennsylvania. Retired from a local steel mill after thirty one years. My best friend is my lovely wife, my greatest accomplishments are my two daughters and my greatest joys are my four grand children. My fondest memories as a child, was visiting my grandparents on their farm in Ohio. The farm had everything, a self abstaining way of life. I can still hear that old dinner bell ringing and smell of the food Grandma would prepare. With no running water, TV, telephone, bathroom or furnace but the warm comfort of Grandma's feather-tick mattress, covers and pillows I still yearn to be on that farm. At the end of each days hard work we would all sit under the big maples in the front yard and listen to all the stories that Grandpa and Grandma would share. Here Grandma would whistle the Bobwhite sound and sure enough the Bobwhite would return a call. Today the Bobwhite is but a memory just like that old farm. As I got a little older I became a Davy Crocket from all the skills my Father and Grandfather taught me as a hunter in the woods. All my life I have enjoyed the outdoors and I thank God for all the blessing he has bestrode on me and all the memories I still cherish. Even today when life gets difficult I turn toward God and his Creation and the memories that he has provide of that old Ohio farm. My favorite food is a roast beef and pizza, desert is berry or apple pie alamode, my favorite cold drink is raspberry ice tea and hot drink is hazelnut coffee, favorite music is country, favorite bird is the hummingbird, That’s right the hummingbird, favorite magazine Birds and Bloom, favorite sport football, favorite holiday Christmas, favorite thing to do; is living with all of the above. Now that I’m retired and more settled, I decided I wanted to give back something to nature. I have always enjoyed birds, it maybe because of their variety and color, but most of all their freedom. In my studies of cavity nesting birds I have discovered their plight in finding a natural nest cavity. I got involved putting up a nest box and watching a pair of eastern bluebirds nesting and fledging their young. Being so inspired by that experience, it led me into another venture. 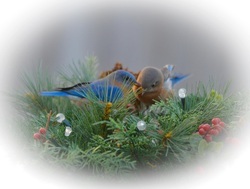 Today I enjoy sharing bluebirds and other cavity nesting birds in leading seminars. As a citizen scientist focused on birds, I would like to share blue birding and the experience of being a good landlord to these wonderful birds with a presentation titled: The Fledging Experience. My Interest is in photography and gardening and the outdoors. I have attended State Bluebird Conferences, received a Blue Feather award and a Bluebirder of the Year award from the Bluebird Society of Pennsylvania in recognition of efforts and achievements to promote bluebird nesting success. I've been a guest speaker at the Mckeever Learning Center in Sandy Lake Pennsylvania, and guest speaker at The Outdoors Club in Butler Pennsylvania, also a guest speaker at Jennings Environmental Education Center and Moraine State Park and shared blue birding with Rotary Clubs, Scouts, School Children, Campgrounds, and various Organizations.